Can you ask for Interim Custody, Care and Control even prior to a Divorce in Singapore? Ancillary issues in Singapore relating to the child, such as custody, care and control, and access orders are not necessarily always determined post-divorce. There may be situations in which these matters have to be determined prior to a divorce. In such events, the parent that wishes to get a court order for these matters will have to make a formal application for Interim Custody, Care and Control of the child or children. The principles surrounding Interim Custody, Care and Control of the child or children prior to divorce are similar to those post-divorce. The primary guiding principle is always that the welfare of the child is the first and paramount concern. Generally, “welfare of the child” is defined broadly, and should be understood in the widest sense. It refers to the overall welfare of the child, and should not be measured simply in terms of monetary or physical comforts. Many other factors, including but not limited to the child’s educational, moral and religious well-being have to be considered as well. What Matters Will Usually Be Considered in Interim Custody, Care and Control Applications? The main ancillary issues parents tend to be concerned about in these types of applications tend to revolve around custody and care and control. In Singapore, custody refers to the making of long-term decisions for the child or children. Another way of thinking about custody is that these are the major decisions regarding the child’s life, such as where the child will be educated and what his or her religion will be. Care and control relates to the day-to-day caring and decision-making for the child. While all aspects of a court order relating to ancillary matters regarding a child are important, parents tend to be the most concerned about care and control. Essentially, the parent that gets care and control of the child will be the person living together with and looking after the child. While custody orders tend to be joint custody orders in Singapore (to encourage co-parenting), care and control orders tend to skew towards one parent. While shared care and control orders are possible, they tend to be the exception rather than the rule. The parent that doesn’t get care and control will usually receive access to the child or children. However, depending on the factual matrix for each individual case, access orders can be liberal or strict. The application for Interim Custody, Care and Control falls under the Guardianship of Infants Act in Singapore. This is an application by Summon with a Supporting Affidavit. 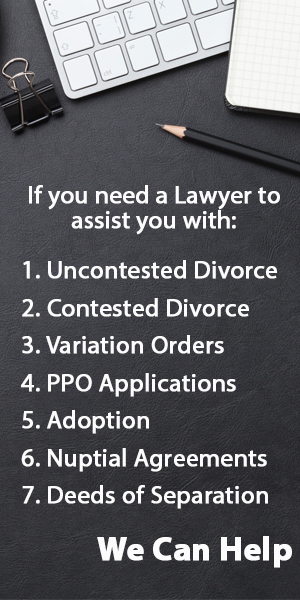 As mentioned earlier, the process isn’t vastly different from an ancillary matters hearing during a contested divorce. Both parties will put forth their respective cases regarding custody, care and control and subsequently there will be a Case Conference. Similar to a contested divorce, the Court may order the parties to attend counselling or to arrange another date for a mediation between the parties. If the issues cannot be settled amicably in a mediation, a date will be arranged for a hearing where the Court will make a decision on the necessary orders. Get in touch with us if you need to take out or defend an Interim Custody, Care and Control application. We answer all your queries within 24 hours.